It seems every day another new fashionable diet plan emerges claiming to be the best method so far in blasting away those pounds in the quickest possible time. Perhaps the biggest problem people struggle with when they look to lose weight is, knowing where to start. There is so much conflicting information out there on what you should and shouldn’t eat you begin to wonder who’s right. The weight loss industry is massive. In the US alone, an estimated $40bn to $100bn is spent on diet products (more than the combined budget for health care, education and welfare). So much focus is placed on achieving a particular weight and look that it can be immensely frustrating trying to reach that goal when there doesn’t appear to be any change, or if there is, not maintaining that change in weight. I’m not saying diets don’t work, you can achieve some dramatic weight loss in a short period of time but this has the added danger of what some refer to as “yo-yo” dieting because it is difficult to maintain the diet or ‘eating programme’. You also run the risk of triggering the body’s energy conservation response if you lose weight too quickly, where the body thinks it may starve and lowers your metabolism to conserve energy (thermic effect). Every new year starts with at least one resolution and for many that resolution is to get fitter and healthier which may very well include losing that extra bit of weight. The sad fact is that within a month, half of those trying to get fitter and healthier remain where they started. Why does it feel as if managing weight is one of the most difficult things to do? Why do so many fail? According to Norwich Union Healthcare, the reasons why people struggle to achieve a desired weight and shape is because of lack of motivation, hectic lifestyles and expense. As with any objectives you have in life, you need to mentally approach it in such a way that is conducive to your desired outcome. This includes having realistic goals and a sense of belief in achieving those goals. If for instance you feel losing 7 pounds in a week is something to aim for, you might be setting your sights a bit too high. Failure to then reduce weight by 7 pounds would deal a blow to any little belief you had in the first place, the mind says to itself “you see I told you it wasn’t going to work and because it hasn’t worked this time, it’s probably even more likely it won’t work the next time you try, so why bother?” This in turn destroys any motivation you had in the first place. If you’re not approaching it with the right state of mind, things become a lot more difficult. Hypnosis is a powerful and effective tool used in hypnotherapy to help create change in your beliefs, attitudes and behaviours. 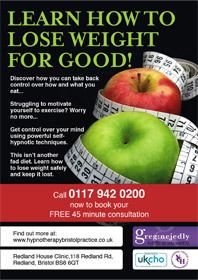 So how do you lose weight safely and keep it lost using hypnotherapy? Weight loss requires motivation and belief in achieving that ultimate goal and using hypnotherapy for weight loss allows you to access those resources such as motivation, confidence, determination, and strengthen them to the point where they begin to work for you. Hypnotherapy weight loss sessions will teach you how to create a positive state of mind, setting up realistic expectations, which help to motivate you towards your ideal weight or size. When you use hypnotherapy for weight loss, there are no fashionable diet plans to adhere to. No carrot juice only plans with a slice of melon to accompany it. What I promote is healthy balanced eating with an improved sense of motivation for exercise using hypnotherapy. Weight loss is achieved through a reduction in caloric intake and increase in exercise both of which will blast away pounds and reduce your weight at a rate that is safe, generally around 2 pounds a week, although a reduction of 5 pounds may be noticed in the first week. This may not seem like a dramatic amount to lose but add this up over the weeks and not only are you well on your way to achieving your ideal size using hypnotherapy for weight loss, but you are far more likely to make it easier to lose weight and keep it that way. Everyone knows what healthy and unhealthy food looks like. As I am not a nutritionist I cannot advise what exactly you should eat but will provide general advise on what you can do to help reduce the amount of energy intake. So yes it does require work and effort, the pounds won’t magically disappear without carrying out both the exercise and reduction in calories entering into your body. You may already be doing this but hypnotherapy for weight loss shows you how you can program your mind to make it far easier for you. You can feel a real sense of confidence, determination and motivation which means you begin to notice how much easier it is to set aside those times to go for a walk, run in the gym, swim and actually enjoy it using hypnotherapy. Weight loss becomes easier to achieve because you have a sense of belief in reducing your weight, fitting into those clothes that used to fit so you can begin to feel lighter and healthier which means you can feel even more confident and happier in yourself which in turn could mean going out, socialising more, not worrying about what others think, perhaps even enjoying the attention. Hypnotherapy weight loss sessions will show you how you can train your subconscious to eat the right foods and feel good doing so, take back control over any emotional eating, help manage your ability to handle stress as well as drive down any residual anxiety levels and build motivation towards exercise and eating well. Over the course of your hypnotherapy weight loss sessions, you will receive plenty of material that is informative and encouraging. Each hypnotherapy weight loss session will reflect on your progress and build on those changes you experience. As well as this, your hypnotherapy weight loss sessions will teach you how to maintain any weight reduction, as the aim is to ensure you have all the necessary tools available to continue what you have achieved, so you can lose the weight and keep it lost! No more ‘yo-yo’ dieting.